Workplace absence is costing the United Kingdom’s economy £18 billion pounds each year – and is predicted to rise to £21 billion by 2020 according to research by the Centre of Economic and Business Research. HR professionals across the UK are reporting that a focus on employee wellbeing can play a significant role in reducing the cost to your organisation. Absenteeism is not the only problem, according to the Office for National Statistics the output per hour worked in the UK in 2015 was 16.6% lower than that of other G7 nations. Focusing on employee wellbeing is likely to increase productivity, the NHS Health and Wellbeing report shows NHS Trusts with higher wellbeing scores perform better financially, have higher patient satisfaction and registers fewer acute infections among staff. Natural light has the power to boost mood, energy levels and productivity. A study by World Green Building Council shows workers that are exposed to natural light sleep on average 46 minutes more than those who are not, and that translates into a 18% increase in productivity. Time to open those blinds! Dull grey offices are a thing of the past – or at least they should be. University of Texas researchershave found that bland grey, beige and white offices induced feelings of sadness and depression. On the other hand, scientific studies have shown how colours can profoundly impact our productivity. Green and blue can improve efficiency and focus. Red increases the heart rate and blood flow, making people more alert. Yellow triggers creativity and innovation. If your employees eat healthy food, all the evidence is that they will be healthier, feel better, be more productive and take less sick days. A few of the things you can do to stimulate healthy eating is offering free fruit, having healthy options in the cafeteria where you have one, at vending machines and by providing a space where staff can prepare healthy food. Implementing a flexible working policy reduces stress and enhances your employees’ work-life balance. Many companies who adopted telecommuting have seen their productivity levels through the roof – Best Buy, British T4 Telecom, Dow Chemical show that teleworkers are 35-40% more productive, and American Express employees who worked from home were 43 percent more productive than workers in the office. You don’t need to go fully remote to see the benefits – allowing your employees to choose when to come to the office or to split time between remote and office based work brings benefits too. Exercise increases blood flow to the brain, increasing alertness. Endorphins released after exercise improve mental health, and energy levels go up too because exercise intensifies your body’s ability to transfer glucose and oxygen throughout your brain and body. Being active also means an overall better physical health and boosts the immune system. Do you have a break room where workers can chill out, relax and take their mind off work? If not, it might be time to think about one. Recent studieshave found that a break once an hour increases work productivity. It is important to encourage employees to take their full lunch break too and avoid eating at their desk. Taking a proper break is a proven way to sustain concentration and enhance creativity. People have the chance to socialise with members of other teams when spending some time at the break areas too, enhancing the potential for collaboration. From simply saying ‘thank you’ to developing an employee reward programme, there is a range of ways to make your staff felt valued and appreciated. At First Base for instance, our employees and temp staff enjoy benefits like shopping, leisure and dining discounts. A CIPD report shows mental health and stress related absences are the second biggest cause of absences in the UK, only losing to minor illnesses such as cold, headaches and stomach upsets. Making a counselling service available to your employees could be the support they need to go through a time of stress or poor mental health, reducing recovery times and making them feel worthwhile and appreciated. Again, at First Base, we offer access to professional counsellors to help with a range of mental health issues via a smartphone app. How seriously organisations take employee well-being is having a significant effect on not only absenteeism but recruitment and retention of talented people. Adapted from an article supplied by our payroll partner, Hive360. 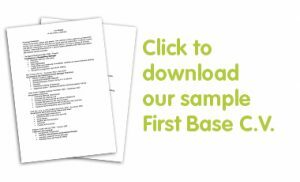 First Base Clients and Candidates tell us we are their first choice because we are reliable, responsive and well connected. If you would like to know more about how our team can help your organistion with your recruitment requirements or with your next career move, contact us on 01453 755330.